We have been raising puppies since 1994. It all started when we got our daughter, then a sophomore in high school, a puppy for Christmas 1990. We picked out a white toy poodle. Her official name - Thompson's Little Miss Tiffany, we called her "Tiffy". 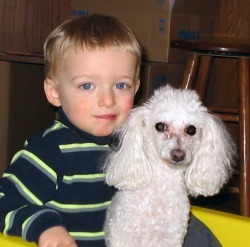 We were blessed to have a pet like Tiffy for 16 1/2 years. From there we have grown to a variety of pure and mixed breeds. We register our puppies with American Pet Registry (APR). For the breeds we offer, click on the Breeds Page. If you have any questions, please call Bob's cell 563-568-1354 any time, or Bob's home 563-535-7632 in the evenings.